Bliain na Gaeilge and Festival Republic are delighted to announce that they will be collaborating on some special feature events at Electric Picnic 2018 in Stradbally, Co. Laois, 31st August – 2nd September. As part of this collaboration, there will be an official Gaeltacht camping area founded on the festival grounds. There will be space provided for two hundred people in this designated camping area, in which Irish will be the common language of the residents. Tickets for Electric Picnic 2018 are sold out, but those who have already purchased tickets will be able to stay in this new designated Irish language camping space. 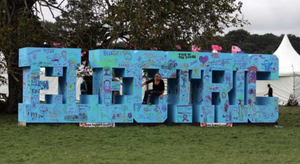 Because of limited spaces, campers will have to register to stay in ‘An Ghaeltacht’ beforehand, at electricpicnic.ie. Applications will open for ticketholders at 10am. tomorrow, Tuesday July 24. Electric Picnic Weather Forecast Latest: It Could Go Either Way You May Like This They’ll Be The Ones Playing In Red Did You Get Droned? Posted in Misc and tagged electric picnic, Irish Language at 10:01 am on July 23, 2018 by Bodger. Maybe the gaelgeoirs should build concentration camps for non-irish speakers? What a lovely idea! The usual knob jockeys will be crying into their cans of Carling going on about how it was taught in school and the waste of it all… Bainigí suit as a cháirde leictreach. Ná dearmad do pháipéar leithreas..
Beidh siad go leir ag deanamh ‘jiving’ (damhsa) as Gaeilge. Conas mar a deirtear cannabis chun meascadh leis an tobac? An bhfuil aon rizla ag duine ar bith? Rules out foreigners and the less neurotic . *shudder*. No thanks. Will there be a special english language section for Béarlóirs? Watch out for a group of Les Bleus who’ll be whooping it up with cans of vin ordinaire Chateauneuf du Plonk. Allez les gars! They could probably use a section reserved for people complaining about Irish being a waste of time. The gaelgoiri will then know who to throw their empty beer cans at. What’s the Irish for circle-jerk? Why is this written in English? Das wissen wir gar nicht. Wenn man uber die Irische Sprache etwas sagen will, soll man auf Deutsch oder Franzosisch schreiben.